I was so excited to get to review the Planet Wise Hanging Wet/Dry Bag. I’d seen their products before — they have an assortment of wet bags in different sizes and configurations, and in lots of attractive fabric choices. But the hanging style that was for both wet and dry items? So appealing. We mostly use a diaper service, and we have a service-rented pail for our prefolds to go in. However, every week we have some undersupply and need to wash some of our own diapers. I wanted something that could hold a few days’ worth of cloth diapers and conveniently hang from our bathroom doorknob. I’ve been very pleased with the Planet Wise bag. The first thing you notice is the vibrant print in a quality cotton. Mine is Daisy Dream. I love all the prints they offer — you’re sure to find one that fits your style and decor. The Hanging Wet/Dry Bag is divided into two zippered sections. The “wet” section is completely waterproofed with a PVC-free, hidden-seam, sealed liner. The waterproof “wet” side of the bag, for dirty or wet cloth diapers, clothing, towels, swimsuits, etc. The lining color coordinates with the print and is PVC-free. I realize this is kind of a pointless picture, but I wanted to show that I tested out the wet section thoroughly by just pouring some water in there straight. After all, if I’m going to be hanging this bag over my bedroom carpet with a whole load of sopping diapers inside, I want to make sure it doesn’t leak! I swished the water around and even squeezed the bag for good measure: Not a drop came out. The dry side stayed completely dry. The “dry” section is just a normal, zippered pouch in the featured fabric. At first I was thinking it looked sort of insubstantial, but now that I’ve used it to store dry items, I’ve found it’s quite capacious and sturdy. The zippers, by the way, are lead-free and coordinate with the bags, and they lock tight when zipped so they won’t open by themselves (but are easy for you to open). I’ve been using this Hanging Wet/Dry Bag for seven months now, and it still looks gorgeous and functions just as I’d hoped. It’s obviously very well constructed, from quality materials. I hang it from our bathroom doorknob and use it for (now) two primary functions: holding our dry and unused family cloth (don’t knock it till you’ve tried it) and holding our wet cloth diapers, family cloth, cloth menstrual pads, particularly dirty clothing courtesy of my kids — anything I don’t want to put into our regular laundry pile but do want to remember to clean, pronto! It works perfectly. Even with the zipper open, there’s very little odor that emerges from the wet side (none at all for peed-on items, a potential temporary smell for particularly stinky things), and the dry items on their own side stay dry and easily accessible. I haven’t had any problems with mildewing, which is also due to the fact that I wash those items pretty quickly, but it’s nice to know that the lining is antimicrobial and, in my experience, leaving the zipper open seems to allow some airflow to cut down on any odors or festering. When it comes time for laundry day, I can either shake out the items from the wet side or, if it’s time for a good wash, shake out the items plus toss the bag itself into the machine. The bag can be machine laundered at any temperature and machine dried, with no damage to the bag or dye transfer to other clothing, which is great when you know for a fact there’s been some rank stuff stored inside it. The cloth of the bag dries fairly quickly in the dryer. The waterproof area sometimes retains moisture, which is to be expected, but I just flip it all back into place and hang the bag up to use again. It hasn’t been a problem. The bag is a very roomy 16.5″ x 27″. (Realize that this is not a bag that would fit in a diaper bag; it’s its own entity.) It holds about two or three days of dirty diapers comfortably, depending on whether they’re of a bulkier or more streamlined sort, and that’s about how often I want to wash them, anyway. Planet Wise suggests it can hold 20-24 diapers total, though I can imagine it would be rather squishy at that point. I haven’t pushed it to its limits in that respect. I’ve seen a friend traveling with the Hanging Wet/Dry Bag, and I think it must be brilliant for that use. (I think it’s even more brilliant for me in particular not to travel with young kids…) You can put your dry diapers/clothes on the dry side, then transfer them to the wet as they become dirty. You can hang the bag from the doorknob of whatever room you’re staying in so it’s always conveniently accessible, then pick it up by the handles when it’s time to move on. It would also work really well as a beach, gym, or swim bag. Even if your swimsuits or towels are dripping wet, they won’t leak all over as you carry the bag back home. They’ve sourced as many USA-made materials as possible and made sure that they meet the highest safety standards, and their products are all manufactured in a local, women-owned facility. Employees are encouraged to prioritize family time through flexible schedules and bringing young children to work. All the products are reusable and have been designed to replace disposable items which help to reduce waste that ends up in the landfills. You can purchase Planet Wise wet bags, wet/dry bags, reusable snack bags, and cloth diapering and breastfeeding accessories online at PlanetWiseInc.com or at other stores locally and online using the international store locator. So many fun things! 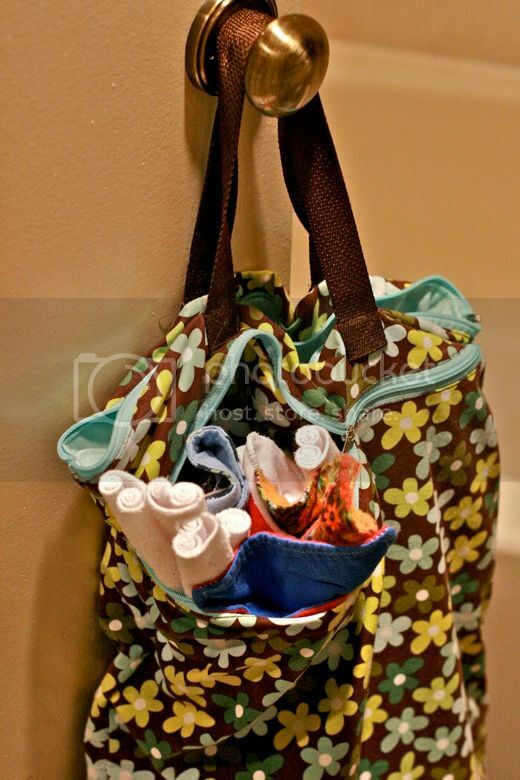 I’d also love to get a second hanging bag for downstairs, and some smaller wet bags to use in our diaper bag (or one of the wet/dry totes to replace it entirely!). MANDATORY ENTRY: Visit Planet Wise’s website and tell us one other item you would love! You must enter your name and email address in the Rafflecopter entry system for your entry to count, after leaving a comment on the blog post. Lauren works and writes at home with her husband and their preschool son, Mikko, and seven-month-old son, Alrik. At Hobo Mama, Lauren blogs about natural and attachment parenting, breastfeeding, babywearing, cloth diapering, green living, and more. Lauren offers reviews and giveaways of natural parenting products at Hobo Mama Reviews and gives a behind-the scenes look at blogging and writing at LaurenWayne.com. Lauren co-hosts the monthly Carnival of Natural Parenting and is the cofounder of Natural Parents Network. I want two of the wipe pouches (for clean and dirty) to carry in the diaper bag. I don’t want to do disposable traveling wipes again. I would absolutely love one of their diaper pail liners. We did without a liner for my last baby, but laundering would be so much easier with one! Love Planet Wise! The prints make me swoon and the quality can’t be beat! I would like River Rock print! I would love the Planet Wise nursing cover to help with our new baby that is on his way! I would love some of their snack bags and the cloth wipes as well. In fact, I’m probably going to order some. I would love the diaper pail liners! I like the organic kaleidoscope. Planet wise has a lot of cool items – some I’ve put on my baby registry! I’ve always wanted the planet wise sport bag! I love the outer space print! I would love the shoulder wet/dry bag! I would choose the outer space print. I have a small wet bag in that print and I love it. I learned that planet wise is owned by a couple and US made with as many American parts as possible. I found out planet wise is a family company.